You’re reading this because of a napkin. It was the year 2000, and I was on a flight to Mumbai. Peter, Johan and I had been building an enterprise content management system (ECM) but kept running up against the challenge of using an RDBMS for querying connected data. That’s when an idea struck. I grabbed a napkin and quickly sketched the first property graph model. Together, we used the idea on that napkin to create the world’s first graph database: Neo4j. What I couldn’t have possibly imagined was the worldwide impact that tiny back-of-the-napkin sketch would create. There’s been a huge business impact to be sure, but there’s also been a steadily growing and (up to this point) quiet impact outside of bottom-line considerations. Collectively, the Neo4j community has been using graph technology to solve some of society’s most pressing problems: climate change, curing cancer, advancing women, money laundering and pushing the boundaries of human knowledge. Whether they’re working at non-profits, government agencies, newsrooms or research labs, these changemakers are working countless hours to make the world a better place. Sometimes they’re individuals and sometimes they’re disparate global teams, but they’re all working against strong headwinds with limited resources and tight (or non-existent) budgets. Yet, they persist in their work – investigating shady connections, unwinding tangled webs of illegal activity, modeling the molecules that wreak havoc on the human body (alongside those that heal it), and mapping our course to the stars. Here and there, you may have heard of some of their projects, but as a whole, they’ve gone unsung. Today, that changes. 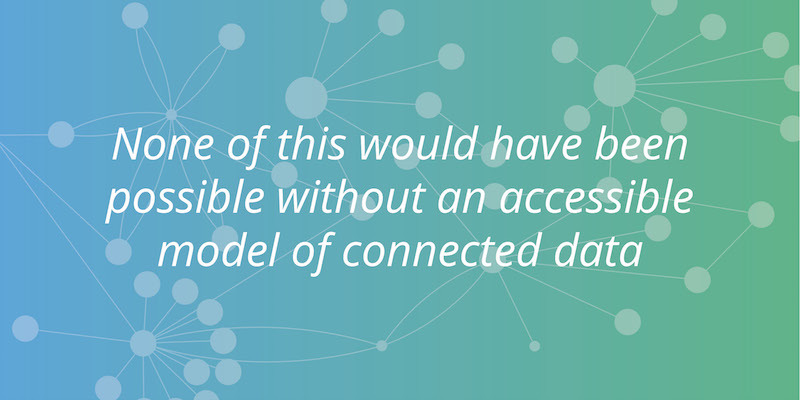 Neo4j’s company vision is to help the world make sense of data. But building a graph database (and other graph technology products) is only a part of bringing that vision into reality. I believe a key pillar of that vision is connecting and enabling those who work with data so they’re more effective. And that’s precisely why we’re launching the Graphs4Good program. This new program aims to showcase – and then support, encourage and connect others to – graph-powered projects that effect positive social change, uphold democratic principles and take on some of the world’s toughest challenges. While we’re officially launching Graphs4Good today (at GraphConnect 2018), the success of these projects – and the support that Neo4j has given them – has already been ongoing for many years. Let me tell you some of their stories. This all starts with the International Consortium of Investigative Journalists (ICIJ). In 2015, they started their groundbreaking work with Neo4j and graph visualization tool Linkurious for their work on the Swiss Leaks story – a look into the secretive and shady world of Swiss private banking. From there, they shook the world with the largest data leak in recorded history: The Panama Papers. The leak of 11.5 million documents – around 2.6 Terabytes – from the Panamanian law firm Mossack Fonseca recorded 40 years’ worth of transactions, accounts and intricate webs of shell companies from some of the world’s biggest names. The subsequent reporting exposed the fraud, tax evasion, money laundering and evasion of international sanctions (along with other illicit activities) among national leaders and celebrities across more than 45 countries. In sum, reporters at 100 news media outlets working in 25 languages used the leaked documents to expose corruption. Their hard work would eventually win them a Pulitzer Prize, but none of this would have been possible without an accessible model of connected data. A year later, the ICIJ released the Paradise Papers: a 13.5-million-document, 1.4-Terabyte leak from Appleby and Asiaciti Trust. Over 380 journalists used this leak to expose the wrongdoings (whether illegal, unethical or both) of big names like Apple, Nike and Facebook, in addition to heads of state such as Queen Elizabeth and members of the Trump administration. It was data journalism investigations like these – alongside the continued spread of fake news – that inspired the Neo4j team to initiate the Neo4j Connected Data Fellowship at the ICIJ, as well as continue our support of the Neo4j Data Journalism Accelerator Program. Since these major projects, the ICIJ has kept up their good work with the West Africa Leaks and a second (but much smaller) leak of Panama Papers from Mossack Fonseca. Within the world of data journalism, I also have to mention the great work done by the team at NBC News at mapping the intricate connections between 200,000 tweets by Russian trolls. Work like this is the heart and soul of what we hope the Graphs4Good program will continue to showcase and support. But data journalism isn’t the only sector where graph technology has been making a positive impact. How could I possibly summarize all of the other impactful projects being powered by graph technology? I can’t – these are only a few notable highlights from names you might recognize. Many, many more are listed on our new Graphs4Good program page. From the dawn of human life, we’ve been fighting disease. We’ve already won against some of the most deadly maladies, but there’s a long way to go, especially when it comes to cancer. I’m personally aware of eight different graph-powered projects working on a cure for cancer. One powerful story in that space is the Candiolo Cancer Institute, and I encourage you to go and read their story. In a similar vein, we’re also happy to welcome the German Center for Diabetes Research (DZD) who uses Neo4j to research the complex struggle to both help current diabetes patients and to eliminate the condition once and for all. Pivoting to an entirely different field, NASA has been using a Neo4j knowledge graph to advance their mission to Mars. 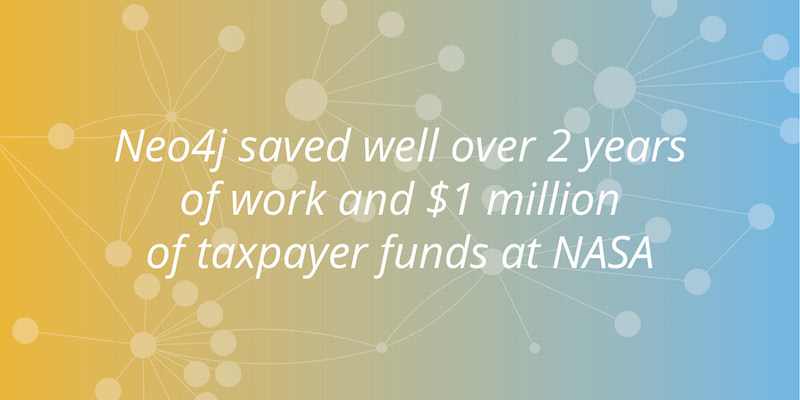 David Meza, the Chief Knowledge Architect at NASA, has said that, “Neo4j saved well over two years of work and one million dollars of taxpayer funds,” specifically in relation to their Orion spacecraft missions. I think we can all agree such work more than qualifies as good. Along the same lines of scientific inquiry, we also welcome the International Salmon Data Laboratory (officially launching in October 2018) to the Graphs4Good program in order to support their work on the holistic analysis of salmon habitats worldwide – and the ecological implications beyond. And finally, this very brief summary of positive-impact graph projects can’t fail to mention what might seem like a small thing for now – but its ripples will be felt for years to come. This past summer, Neo4j team members were able to sponsor and lead a data science camp through Pink Programming – an organization with the mission to advance the role of women in technology. While the camp this year was small (20 women), they were able to learn how to use graph technology to grow their skills in data science. Twenty years from now, I hope to hear the stories of how those women were able to positively influence the tech ecosystem for decades to come. Graphs are a new(-old) way of looking at the world, and that new perspective gives us a tremendous power to transform our society for the better. Each day, I hear stories of how graph technology is being deployed to make positive change, and I continue to be amazed and humbled by the world-changing work of the Neo4j community. Many of the projects in the Graphs4Good program were born as (and some continue to be) community-led, open source projects. I cannot emphasize that factor enough: The Neo4j community is here to help you make a positive global impact. This community is a friendly and dedicated graph of people who generously contribute their time and effort to get your graph-powered project up and running (or keep it running smoothly) – no matter your cause. 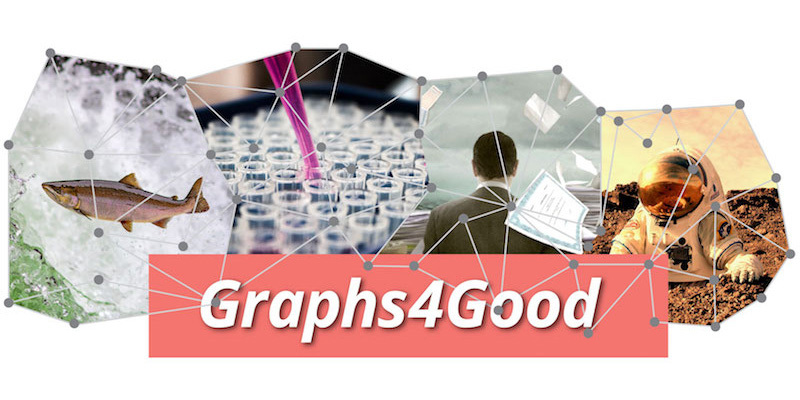 Today, we launch the Graphs4Good project with hundreds of stories of positive impact using connected data. Next year, let’s make it thousands. Our team’s impact started with a napkin. Yours starts with a graph platform – what will you do with it?